Sudanese President Omar al-Bashir at the meeting of Africa’s communications and IT ministers (Credits: AFP). At a meeting of Africa’s communications and IT ministers on Wednesday, September 5th, the states’ representatives discussed the creation of an African Space Agency they called AfriSpace. The new Agency would be formed as a cooperation of African States for the peaceful uses of space research and technology in the African Union (AU). 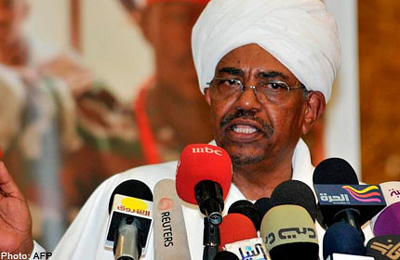 “I’m calling for the biggest project, an African space agency,” said Sudanese President Omar al-Bashir Bashir. AfriSpace would facilitate “cooperation among African states in space research and technology and their space applications,” says a working document published for the African Union conference. The first step towards a common approach for African space policy was the founding of the Regional African Satellite Communication Organisation (RASCOM) twenty years ago. In 2007 RASCOM launched a satellite, the ill-fated RASCOM-QAF 1, which failed due to a helium leak and had a shortened operational life of 2 years after reaching geostationary orbit. The replacement satellite was ordered immediately and followed in 2010. These satellites provided voice and data services to the entire African continent. They provided support to health projects, broadband internet connectivity, radio and TV broadcasting as well as health education, according to the organization’s homepage. To expand on this idea of a common peaceful cooperation in space research, the African Union Commission was asked to conduct a feasibility study for an African Space Agency at a conference of Communications Ministers in 2010. This paper was seen as a “roadmap for the creation of the African space agency,” and contained the observation that only a minority of African countries have space technology. Today, only South Africa, Nigeria, Egypt, and Morocco have space agencies on the continent, and their scope is limited. None of those nations currently have their own launch capabilities. However, this minority play a major role in African broadcasting, weather forecasting, environmental and agriculture monitoring, health, and more. “A common continental approach will allow the sharing of risks and costs and ensure the availability of skilled and sufficient human resources,” the document said. AfriSpace could provide a long-term space policy for the African continent with the aim of coordinating space resources of the member states. With demand for internet and phone access increasing, information and communications technology is taking on an evermore important role. However, whether a continental space agency can compete for resources and attention in a region beset by poverty, malnutrition, and conflict remains to be seen. Just to clarify on the issue not mentioned in this article. The name ‘AfriSpace’ is a brand and website (AfriSpace.org) of our commercial space agency (Orbital Horizon) and has been in very active use for the past three to four years along with my nonprofit agency, the African Space Institute. We’ve invested a lot of time and resources into marketing the AfriSpace name with our space outreach activities and have had an excellent reception and brand recognision worldwide. We are currently seeking communication through diplomatic channels with the AU regarding their use of the name AfriSpace which so far have proven useless and the AU have completely ignored all efforts of communication. This has created much negative publicity, a lot of confusion and has been extremely misleading. Since the AU’s announcement on last Tuesday, the public have been thinking we are the AU space agency while our international partners are asking what is going on. Below is an article from the Guardian newspaper highlighting the name conflict issue. We hope this situation is dealt with and not ignored by Africa’s governments. We are wanting to talk with the AU and work out a solution. However with what seems like a complete disregard for doing copyright searches or even a basic Google search, the protection of IP and copyright protection of commercial space assets in the space arena in Africa is a little worrying. — Is he not a wanted war criminal? My how quickly things change in Africa.